When the 1965 NFL season ended, Jim Brown was the star of the league. He was the 1965 MVP after rushing for 1,544 yards in a 14-game season, which was 677 yards more than the runner-up, a Chicago Bears rookie named Gale Sayers. At that moment, Brown was the sport’s leader in single-season and career rushing yards, rushing touchdowns and total touchdowns. In nine years of pro ball, Brown was the rushing champion eight times and the MVP three times. But he was bored. So when the season ended, Brown was out in London filming the movie The Dirty Dozen, trying to stimulate his mind. It was his second acting appearance and because of delays in filming, the days kept creeping closer to when Brown would have to return to prepare for the next NFL season. He realized he had a decision to make. It was July already, and Brown was about to enter the final year of a two-year deal that paid him a little over $60,000 per year. But if he wanted to play the next season and collect his money, he’d have to ditch the film. Browns owner Art Modell issued a statement with an ultimatum in it. 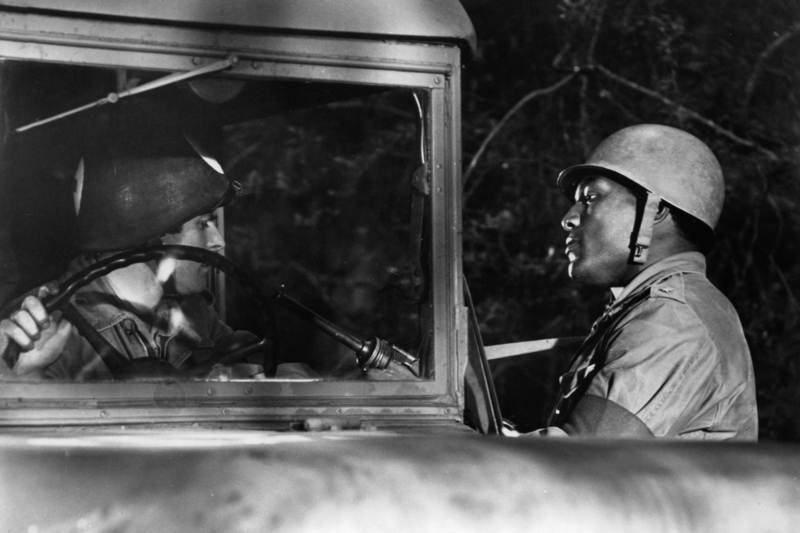 Jim Brown holds up an ambulance driver in a scene from the 1967 film The Dirty Dozen. Modell even started fining Brown $100 for every day that he didn’t show up. But no one told Brown what to do. Not even the owner of the team he played for. A few days later, Brown let Modell know what was about to happen. There were no minced words. I am writing to inform you that in the next few days I will be announcing my retirement from football. This decision is final and is made only because of the future that I desire for myself, my family and, if not to sound corny, my race. I am very sorry that I did not have the information to give you at some earlier date, for one of my great concerns was to try in every way to work things out so that I could play an additional year. I was very sorry to see you make the statements that you did, because it was not a victory for you or I but for the newspaper men. Fortunately, I seem to have a little more faith in you than you have in me. I honestly like you and will be willing to help you in any way I can, but I feel you must realize that both of us are men and that my manhood is just as important to me as yours is to you. It was indicated in the papers out of Cleveland that you tried to reach me by phone. Well, I hope you realize that when I am in my apartment I never refuse to answer my phone. The only reason that I did not contact you before I knew the completion date of the movie is that the date was the one important factor. You must realize that your organization will make money and will remain successful whether I am there or not. The Cleveland Browns are an institution that will stand for a long, long time. I am taking on a few projects that are very interesting to me. I have many problems to solve at this time and I am sure you know a lot of them, so if we weigh the situation properly the ‘Browns’ have really nothing to lose, but Jim Brown has a lot to lose. I am taking it for granted that I have your understanding and best wishes, for in my public approach to this matter this will be the attitude that will prevail. Brown, one of the most revered and respected football players and activists in history, went on to appear in some 44 films (including 17 lead roles). As Modell learned the hard way — no one ever told Brown what to do.